We tried to break it! And I mean we really tried. My friend Johnny was kind enough to do the honors. We have a favorite campsite in the Rockies up above the town of Como, Colorado. There is a great four-wheel drive trail in the mountains just beyond the campsite. This is where we took the Outdoorsman for a ride. You can watch the video at our Videos page. The Outdoorsman was packed with the normal gear we use on camping trips. This includes a single-burner propane stove, a small propane lantern, a couple of propane canisters, a pot and pan set, utensils, silverware, savory spices, extra-virgin olive oil, balsamic vinegar, paper towels, plates, cups, a Henkel knife set, a number of nonperishable food items, and a bottle of wine. Sunday morning, Johnny showed up bright and early along with Herb, Matt, and Sarah (three of my kids); John, our videographer and my nephew; my brother Dorraine and his wife, Ruth; and Mike, a good friend from Canada. We packed up the Outdoorsman and strapped it onto the hitch platform Johnny uses to tote extra gear on his Jeep. Herb drove his SUV with John and his video gear. Herb opened the sunroof on his SUV, and John stood on the seat with half of his body and camera outside. The first couple of miles is a modest gravel road, then we turn off onto a US Forest Service four-wheel drive road. This is when the fun really began. 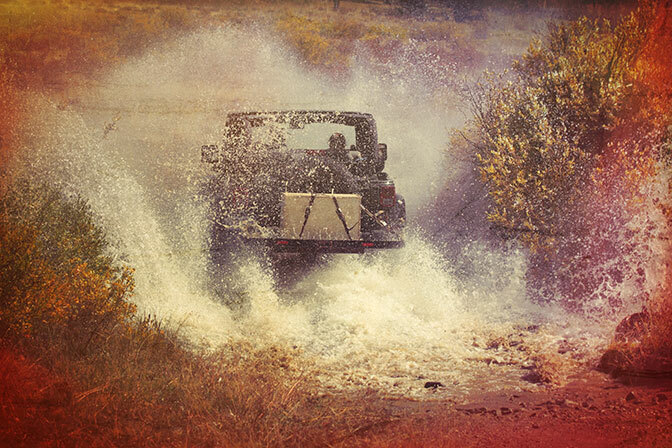 Johnny loves speed and rough rides, so he was right at home going as fast as he could over the rocks and rough terrain and through many water crossings. From the point at which we started on the FS road, it is about 10 miles to the continental divide overlooking Breckenridge. My brother, five years my senior, drove Sarah’s truck to the divide—a major feat for someone who doesn’t like to drive. He’s no wimp, that’s for sure. Neither was the Outdoorsman. It was exposed to it all—dust, water, and a rough beating. You have to see the video to appreciate it. After reaching the summit, we paused for a breather and took photos of the spectacular views. Then we headed back down just below tree line to our favorite campsite. It was then that we set up and opened the Outdoorsman and found everything was intact!! Nothing broke, and it was dry inside despite all of the water it had been exposed to. Some dust did find its way in, but nothing that got in the way of cooking a great meal. I was very pleased. We certainly don’t recommend such abuse on a regular basis, but taking the Outdoorsman four-wheeling with sane drivers is a piece of cake. My sincerest thanks to everyone who tried so hard to break my kitchen. Recently while enjoying a coffee at Starbucks with a friend, we were discussing My Camp Kitchen’s new release, the Outdoorsman. 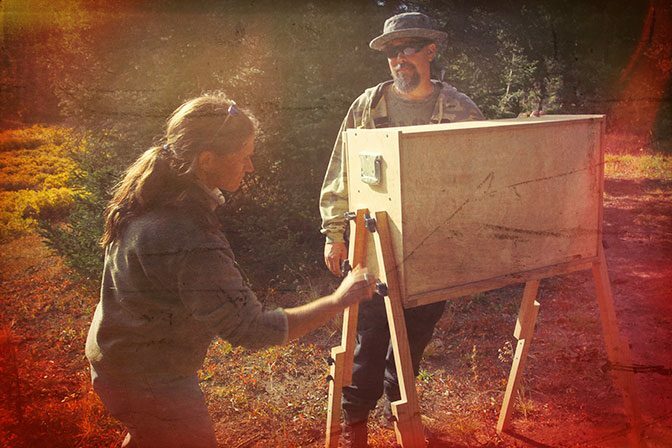 Although it usually refers to building up equity or value in a house by doing a lot of work yourself, or in other instances, acquiring ownership in a business by investing labor rather than cash, “sweat equity” fits our new Outdoorsman kit rather nicely. 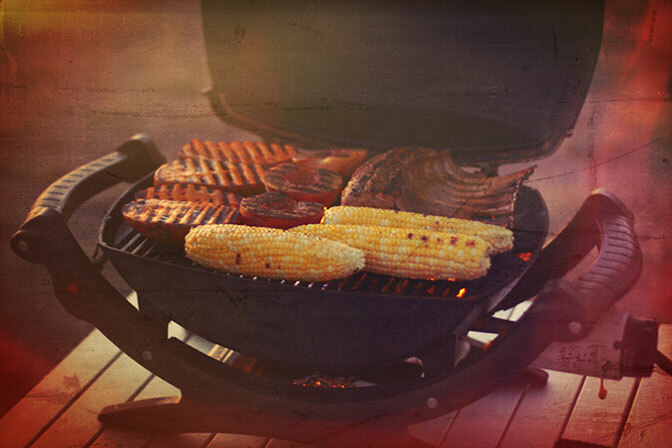 If you’d like to build some sweat equity while saving money, check out the Outdoorsman kit today! I was recently camping in Steamboat Springs with some friends. I brought a Summit with me, of course. Many neighbors came by and were looking at my kitchen, as they are wont to do. One person in particular had a lot to say about our kitchen. 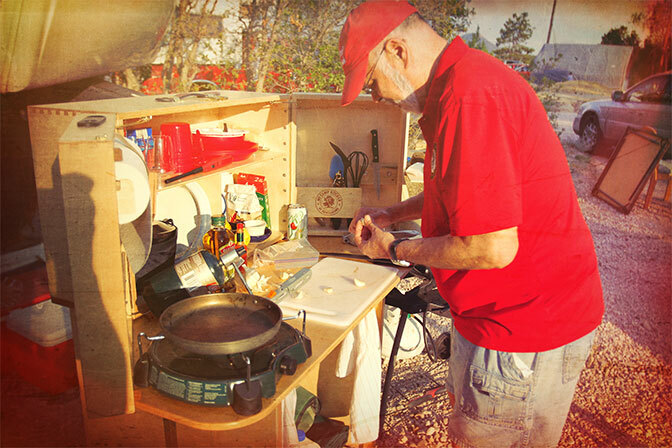 He had an aluminum kitchen set up in his campsite and was really impressed by the stability of My Camp Kitchen’s Summit. Apparently, the aluminum kitchens are wobbly. You’ve gotta be really careful around them—no kids playing and beware in windstorms. He kept pushing the Summit from a variety of angles and could not get it to budge. He was seriously impressed. Fortunately, I had some brochures, so he is going to check us out online. I am passionate about a number of things in life, two of which are camping and cooking. In all my years as an engineer working long hours, it was the weekend camping trips and weeklong camping vacations with my family that re-energized me for the weeks to come. Until recently, we were tent campers. I have always looked for ways to become more organized and to make it easier to get ready, easier to set up camp, and of course easier to come home and get ready for the next trip. We started out with five kids in a 1961 Ford Falcon, and we had to be organized just to fit. That is how My Camp Kitchen got started. There is no greater joy than to be able to share the things one is passionate about with others. 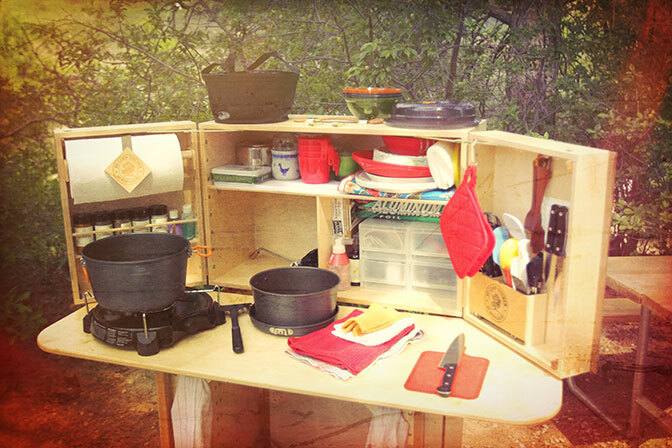 Joining my engineers’ eye for detail with my love of nature and cooking has enabled me to share with the world a really simple and organized way to cook outdoors while keeping all the kitchen gear and supplies right where you want them whenever needed. I hope you all enjoy our outdoor kitchen systems as much as we do! !